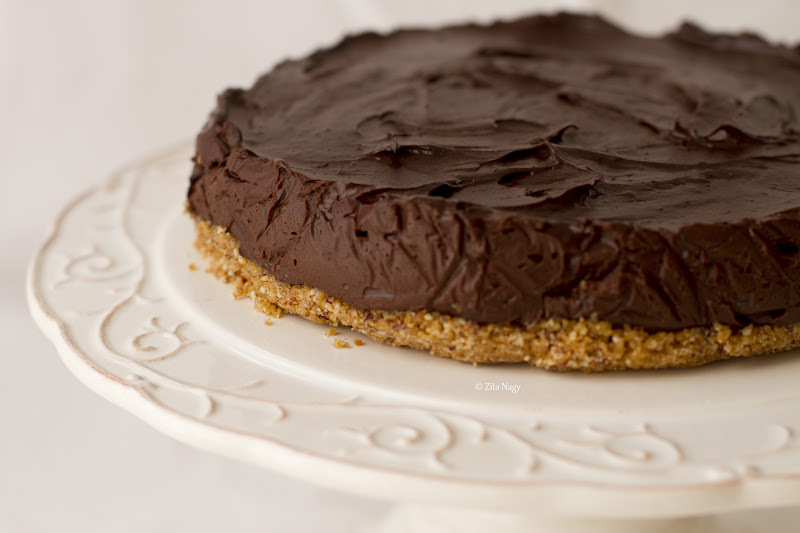 I have to tell you: this is the world’s best yummiest raw chocolate cake ever! I can even say: this is the best chocolate cake. I don’t tell you to make it. 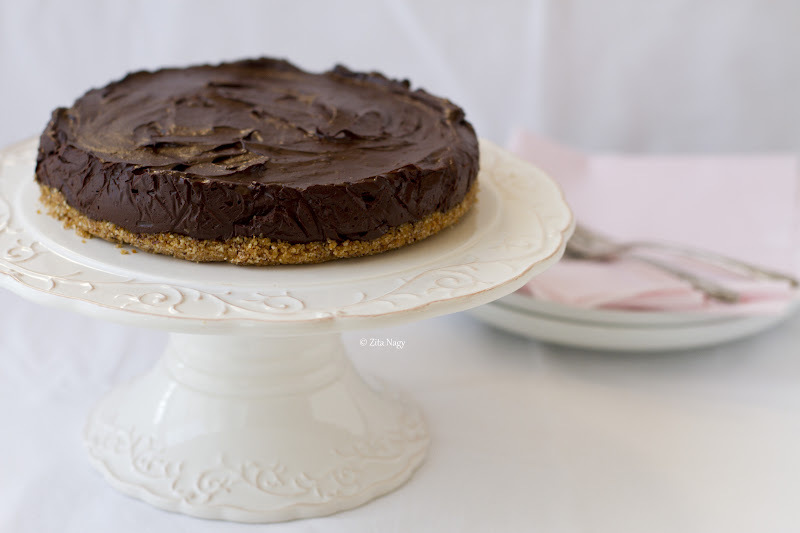 I’d rather say: if you don’t make it you will miss your best raw chocolate cake moment! 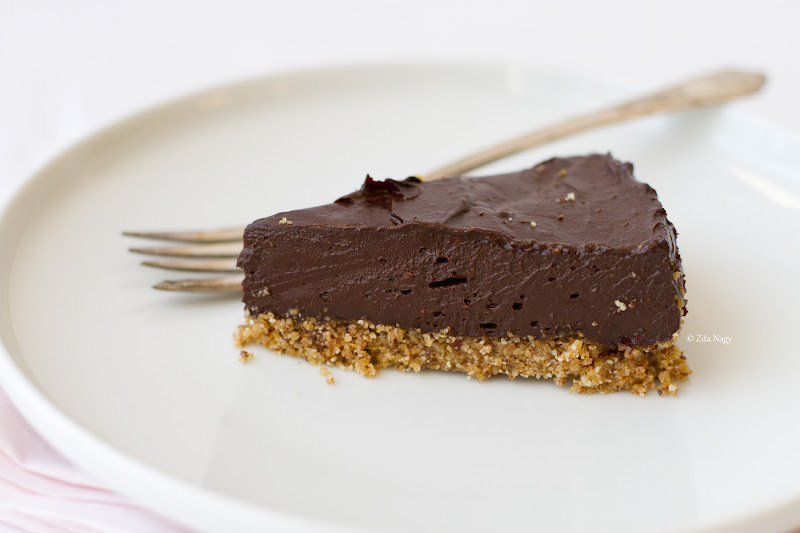 Raw, vegan and full of chocolate? How can this happen? Does this mean this is a healthy, sweet, very chocolate-y experience? Yes, if you don’t count the 100 grams coconut flower sugar, this cake is nutritious, healthy, full of vitamins and minerals. The base contains dates, almonds and Himalayan salt. Almonds are rich source of vitamin E, containing 26 miligrams per 100 grams. Raw almond is high quality protein, a third of which are essential amino acids.They are also rich in dietary fiber, B vitamins, essential minerals and monounsaturated fat, one of the two fats which potentially may lower LDL cholesterol. Health benefits of dates are uncountable, as this fruit is affluent in natural fibres. A 100 gram portion of fresh dates is a source of vitamin C and supplies 230 kcal (960 kJ) of energy. Dates are even rich in other vitamins and minerals. These natural product contains oil, calcium, sulphur, iron, potassium, phosphorous, manganese, copper and magnesium which are advantageous for health. 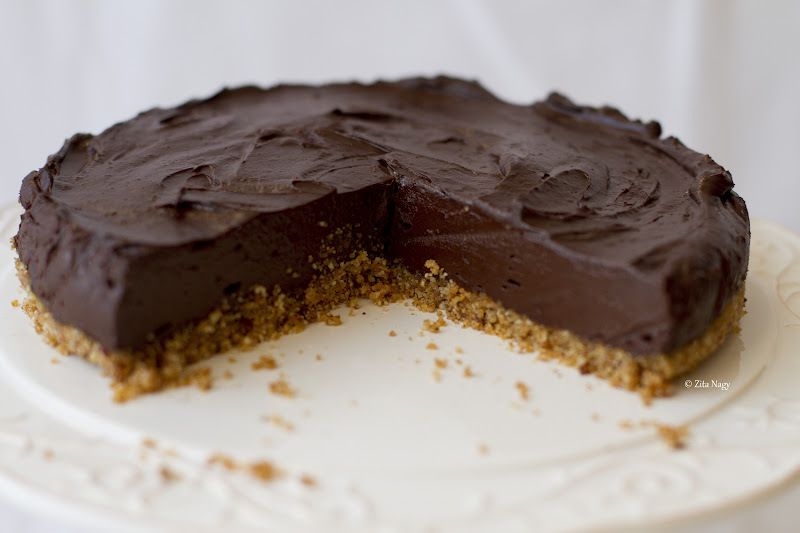 The base of the ganache is avocado. Avocados are a good source of fiber, potassium, and vitamins C, E, K, folate, and B6. Half an avocado has 160 calories, 15 grams of heart-healthy unsaturated fat, and only 2 grams saturated fat. One globe contains more than one-third daily value of vitamin C, and more than half the day’s requirements of vitamin K.
Cocoa contains a large amount of antioxidants (flavinoids). Cocoa beans are rich in a number of essential minerals, including magnesium, calcium, iron, zinc, copper, potassium and manganese and in vitamins such as A, B1, B2, B3, C and E.
Oh and I shouldn’t forget to mention the name of the goddess who I learnt to make this cake from. 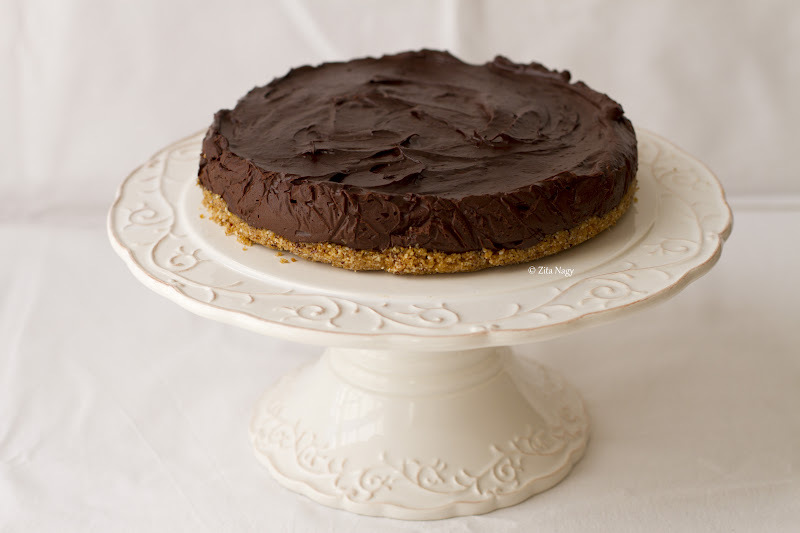 Laura Coxeter is a raw food specialist and she showed Hugh Fearnley-Whittingstall (in the TV show River Cottage “Veg Every Day”) how to make a sumptuous chocolate tart with wholesome raw ingredients. If you have time soak the almonds for at least 6 hours then drain and dehydrate them (The soaking releases the enzyme inhibitors and makes them easier to digest.). 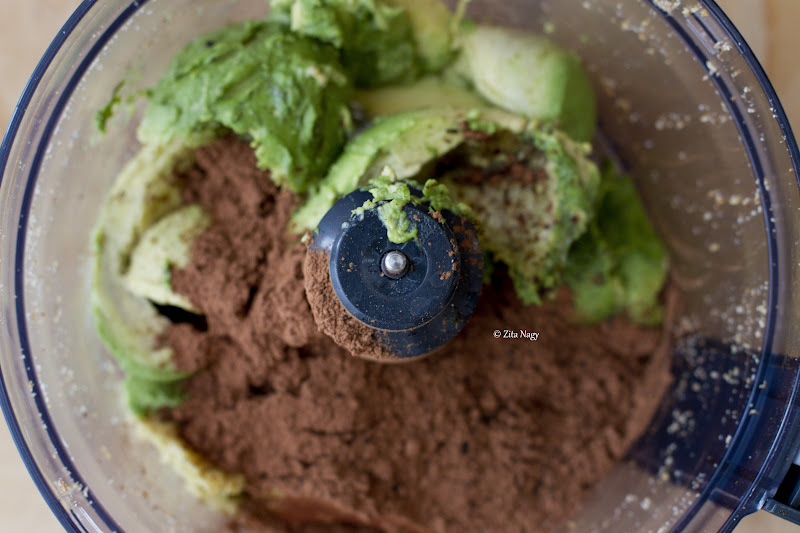 In a food processor blend the almonds. Add dates and salt and blend until you get a ‘dough’ or until the mixture forms a ball (if it’s too dry, add 1-2 teaspoons coconut oil to the dough). Line the spring form pan with cling film and press the dough into the bottom of the pan. Place it in the freezer to harden until you make the ganache.